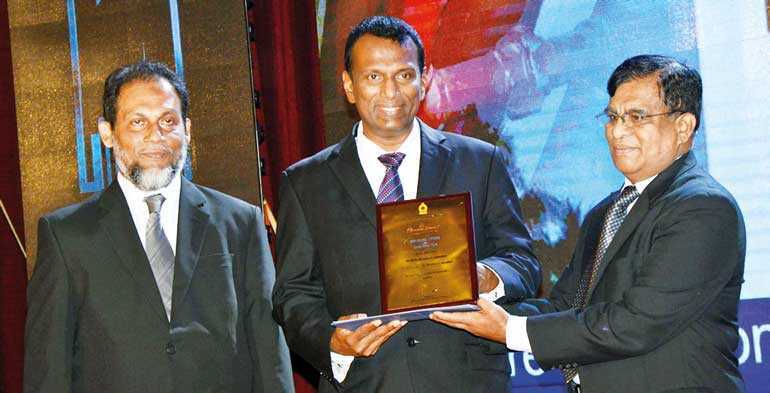 Consolidating its reputation as one of Sri Lanka’s most trusted brands in engineering, Hayleys PLC subsidiary, Fentons Ltd., was presented with two awards at the recently concluded National Awards for Construction Excellence (NACE) 2018. The company was presented with awards for National Excellence Award for Building Projects and the Excellence Award for Electro-Mechanical Construction. Notably, both awards were presented to Fentons in recognition of its remarkable work in building the entire electrical and fire detection and protection systems at the Weligama Bay Marriott Resort & Spa. “This award represents the culmination of a great deal of hard work and dedication on the part of the entire Fentons team and at the outset, I wish to thank each of them for their efforts. For almost a century, Fentons has consistently worked to raise the standard of construction in Sri Lanka. Our work on the Marriott Hotel, Weligama, is one of many projects we have undertaken that encapsulates the breadth and depth of expertise that Fentons offers and we are deeply honoured by this resounding recognition of our work,” Fentons Group Managing Director Hasith Prematillake said. Organised by the Construction Industry Development Authority, under the auspices of the Ministry of Housing and Construction, the NACE is considered one of the most prestigious national platforms for showcasing outstanding performances in the field of construction management. “Since its inception, Fentons has successfully undertaken some of the most ambitious and challenging engineering projects in the country, and the Marriott, Weligama is certainly one of the most prestigious projects in our portfolio to-date. As a globally renowned franchise, the Marriott International demands the most stringent construction and safety standards in the world. “It is therefore a testament to the skill, dedication and technical expertise of our team, that we were able to complete this project – which was valued at approximately Rs. 400 million – on schedule. Moreover, we were able to pass the Marriott’s extremely stringent fire safety audit on the very first inspection, which is no mean feat. Our team also learned a great deal in the process, and we look forward to deploying this knowledge on more domestic projects in future,” Prematillake elaborated. Established in 1921, Fentons Ltd has steadily built up a reputation for as one of the industry’s most competent and most trusted engineering companies in Sri Lanka. The company is an end-to-end solutions provider capable of managing complete project requirements. From supply, installation and commissioning to providing outstanding aftersales care and advanced repair capabilities, Fentons is a name powered by business relationships that span generations. A subsidiary of iconic diversified conglomerate, Hayleys PLC, Fentons combines the value of engineering and innovation with adherence to exceptional client service in order to cater to the diverse and exacting needs of clients spanning banking, finance and insurance, hospitality, high- rise developments, stadiums, education, healthcare, manufacturing and telecom, broadcasting and more.